These are all songs we sing together at circle time at Family Inventors’ Lab, a STE(A)M enrichment class for ages 3 – 7. To see the full lesson plan for any theme, just click on the name of the theme. 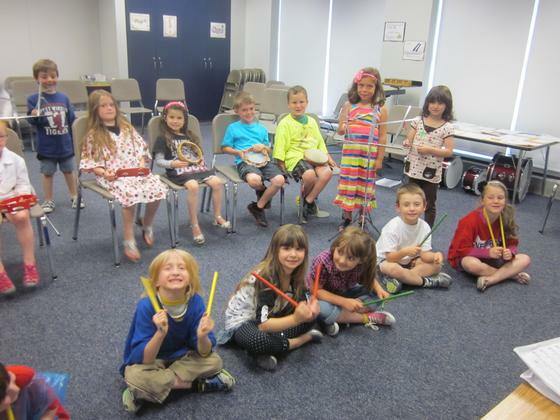 Here’s info on why we use music in a STE(A)M enrichment class. I think it’s my best invention yet. Here at the Inventor’s Lab. We’re going to build a bridge today, hurray! hurray! And we’ll all be learning together while we play. Lay the bricks… Paint the walls…. You could also do these verses to match the actions in the book Building a House by Barton. Song 2: “When I build My House” by Parachute Express. www.youtube.com/watch?v=VBfJbbHJej0 (starred lines are done as call and response – you sing, they echo.) Mime the steps with rhythm sticks. On second verse swap in… I’ll need some nails… and I’ll hammer the nails. After singing third line with nails, repeat the third line with sawing the wood. Verse 3: bricks, lay the bricks. Verse 4: Paint, paint the walls. Zoom down the freeway, zoom down the freeway, zoom down the freeway. Stop. Up goes the drawbridge, Up goes the drawbridge, a boat is going past. Down goes the drawbridge, down goes the drawbridge, the boat has passed at last. Zoom down the freeway, zoom down the freeway, zoom down the freeway. Exit! Then ask kids to suggest something they use electricity for, and we substitute in those words. Song: Button Factory. Tune here. One day my boss came up to me. [Kids start miming pushing a button. On next verse, say “push this button with your left hand”, and kids push with both the right AND the left. Keep adding verses and actions… push with left toe, hip, forehead, whatever – it gets sillier and sillier. When you’re ready to end, say ‘“Joe, are you busy?” I said Yes!! !’ and fall down. And bring us some loaves in the morn. A wheel and axle or an inclined plane. They’re all simple machines, oh simple machines. Song 2: Move It Work It from Capstone kids (has a companion book by Salas) which is to the tune of Kookaburra. Find the song here. Song 3: Simple Machines song from Hubpages unit on simple machines. It’s done to the tune of Yankee Doodle. Find it here. Chorus: There’s matter over here. A solid keeps its shape. A liquid will be found. It’s wet & flows to fill a shape. And drips down to the ground. Gas is in the air. You can’t see it but it’s there. It blows and flows right through your nose. Cake Recipe song from Patty Shukla. Before teaching the song, teach kids clap the rhythms of the chorus: 1-2-3 1-2-3 mix-mix-mix mix-mix-mix and 1 2 3 4 mix mix mix mix. The best part is at the end. When I get to put on the icing. [Say:] And lick the spoon! U-HUH (repeat) OH-YEAH (repeat) One more time (repeat) Cowboy Style! On the wall, On the wall. Some are tall, Some are tall. Other nice options on Preschool Express on Perpetual Preschool, or on this YouTube playlist. There’s lots of great dinosaur songs / videos for listening and watching on YouTube. Check out this playlist. There’s lots of preschool level songs about dinosaurs that you could use for circle time at Perpetual Preschool, Preschool Express, and Kidsparkz. Song – We Will Stomp You. From Perpetual Preschool. To the tune of We Will Rock You. I’m ankylosaurus I’m big and strong; 10 feet tall and 30 feet long. Don’t get too close Or I’ll give you a whack. Chorus: We will , we will stomp you, stomp you. We will, we will stomp you, stomp you. Stegosaurus is my name. A little walnut is the size of my brain. On my back are seventeen plates. Leaves and plants Are what I ate. I’m tyrannosaurus rex I’m big and mean. The meanest dinosaur That you’ve ever seen. I’ll pick you up with my big sharp teeth. I will, I will, Chomp you, chomp you. I will, I will CHOMP YOU !!! In class, we play the “Cassady will Rock You” video and kids clap along and sing the chorus. There’s another video version from Emily B. There’s another set of lyrics at Beakers and Bumblebees, and here’s one from the National Park Service website. We will – we will – rock you! We will – we will – rock you! We will, we will – rock you! We will – we will – rock you! Song – Did you ever see a magnet? From www.tooter4kids.com/Magnets/magnet_poems.htm. To the tune of Did you ever see a lassie. Did you ever see a magnet, a magnet, a magnet? Did you ever see a magnet pull this way and that? Chorus: Pull this way and that way, and this way and that way. On iron and steel, its pull is unreal! A magnet has action, it’s called an attraction! This is a companion to the “Did you ever see a magnet” song we sing in magnet week. These words by Janelle Durham, to the tune of Did you Ever See a Lassie. But you can see gravity pull this way, not that. Chorus: Pull this way, not that way, pull this way, not that way. You can see gravity pull this way, not that. Oh, you can see gravity pull things to the ground. An alternate song, to the tune of London Bridge, can be found here. Zoom Zoom Zoom, we’re going very soon. Song – Dem Bones. Tune, jazzy tune. The ankle bone’s connected to the shin bone. The shin bone’s connected to the knee bone. The hip bone’s connected to the back bone. The back bone’s connected to the neck bone. The neck bone’s connected to the head bone. What are the senses, can you tell? Look, Listen, Taste, Touch, Smell. We’re using our five senses…! Like BINGO, you can start dropping words – first time through we just point at eyes instead of saying look, then we say listen, taste, touch, smell. On second time, we point at eyes, then ears, then say taste, touch, smell, etc…. Song – One of these Things is Not Like the Other from Sesame Street. After each time you sing the song, show a picture of four animals, three from one category, and one that doesn’t belong to that category. Have the youngest children guess which doesn’t belong, and have older children tell what criteria show us that animal doesn’t fit with the others. Forests are where the deer live, the deer live, the deer live… forests are where the deer live, It’s their habitat. Song – I’m a little chick – tune of I’m a Little Teapot. I’ll spread my wings (hands in armpits and flap) And cheep, cheep, cheep. Song 1 – Caterpillar. We found this song on https://kcls.org/content/caterpillar-caterpillar-crawl-crawl-crawl/ but Janelle added the first verse and revised some of the words a little so they scanned better to the music. Done to the tune of Frere Jacques / Are You Sleeping. curl up in your egg, curl, curl, curl, curl, curl, curl. crawling on a green leaf crawl, crawl, crawl, crawl, crawl, crawl. eating leaves all night, eat, eat, eat, eat, eat, eat. spin a silk cocoon, spin, spin, spin, spin, spin, spin. sleep until you bloom, sleep, sleep, sleep, sleep, sleep, sleep. Song 2 – From Growing Up Wild book. to the tune of Head, Shoulders, Knees and Toes. Six legs, some wings, and an exoskeleton. An alternative would be this, inspired by Preschool Education. Theme – Sink or Float. Song – Will It Float by Janelle Durham. Tune – London Bridge. Accompanies a demo: Hold up an object, sing the song, then ask for the kids prediction. Test it. Will it float or will it sink? Will it float? Will it sink? Will it float or will it sink? What do you think? Heavy things usually sink, usually sink, usually sink. Heavy things usually sink, but it depends upon their shape. some shapes float better than most, and others tend to sink. Lived a mother parrotfish and her parrotfish two. So they ground on the coral where the sea grasses grew. Over in the ocean, in the sea anemone. Lived an old mother clown fish and her little clown fish 3. Dart said the mother, we dart said the three. So they darted all around in a sea anemone. Lived an old mother puffer and her pufferfish five. Lived an old mother dolphin and her little dolphins six. Lived a mother needlefish and her needlefish eight. So they fluttered all around in their turtle grass den. While their parents all were resting they up and swam away! When you find all the creatures than this rhyme is all done. Other options are: All the Fish are swimming in the water (www.youtube.com/watch?v=60RRRq4dJ58 or http://kcls.org/content/all-the-fish-are-swimming/); Slippery Fish (www.youtube.com/watch?v=YkQeX2nBH3Y and hand motions here: www.youtube.com/watch?v=0C9HSOlb4qI); Yellow Submarine, or Under the Sea. Resource: Check out this post (and collection of related resources) about the Benefits of Singing with Children or check out research summaries on music’s benefits. Here are all the rhythm activities we use in class to teach rhythm skills. And here are some thoughts on how we use music in our STE(A)M enrichment class. Jack Hartmann: Hear previews: https://www.jackhartmann.com/album/science-songs-for-kids-science-songs/ Purchase from Amazon. Thank you so much for compiling this. I work at a science museum in Australia and have shared this with our subscribed teacher members.